Had your heart set on seeing the Ashton Kutcher-led flick on the life of Steve Jobs come April 19? Sorry to be the bearer of bad news, but it sounds like 'Jobs' won't make that U.S. premier date after all. 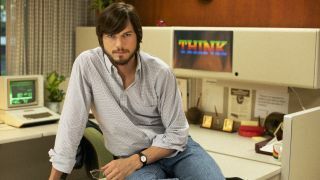 The Hollywood Reporter has insider information that the biopic, staring Kutcher as the late Apple chief, won't show on the day marking the 37th anniversary of Apple Computer's founding. While that inaccurate and painful trailer probably did the film no favors in creating an eager beaver fan base, the reason for the pushback seems to be marketing related. Open Road Films, the movie's distributor, apparently wants more time to market the film. No new release date has been set. 'Jobs' made its world premier at the Sundance Film Festival in January and follows tech mogul's evolution from college dropout to, well, the Steve Jobs of epic proportions. Not to be confused with an Aaron Sorkin-envisioned, Sony-backed project based on Walter Isaacson's bio of Jobs, Kutcher's flick is an independent affair. Check out the trailer below. Perhaps the marketing crew should come up with one a little less TV movie-like?